The excellent rock and the absolute verticality of this structure have always attracted the strongest climbers. 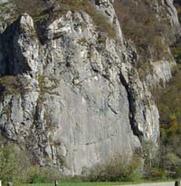 In fact, already in the sixties a group of strong mountaineers, such as Casimiro Ferrari, Vittorio Meles, Pierlorenzo Acquistapace, climbed the parades with the intent to experiment with the new techniques of 'artificial climbing, but desperately climbing only the most compact features of the wall. A few years later, in October 1974, Don Agostino Butturini and his group of young Condors were rather perplexed when they realized that, by repeating those forced lines of pressure nails, the possible ways on the holds and natural holes, ready to welcome the nice pigeons, they had not even been touched. Thus Don Agostino begins a meticulous exploration of this structure and of those adjacent to the "Pala" of the "Wall" of the "Pilastrini" of the "Grande Placca". The rules were strict: it always opened from the bottom with the boots, it bolted where it was possible to have very rare perforations for the nails. The verticality and the compactness of the structure led to immediately raising the degree of difficulty in the nailed sections; then came Ivan Guerini who freed the classic routes of the "Condor", thus offering a further new game. But the real architect and valorizer of the wall is certainly Marco Ballerini who in 1981 understood how on this rock you could experiment with the difficulty, creating difficult itineraries but always splendid and bringing sport climbing in the Lecco area. On this structure the nailing is not always close and considering the style of climbing, it requires at times in certain engagement, at least on the most demanding routes. The style on the central plate, needless to say, is the technique at maximum expression, with very challenging individual balance, even on the most accessible routes; in the overhanging sector, on the other hand, we need to deal with single intense fingers and short physical sections. The numerous historical number of climbers in the past few years seems to have diminished; here in fact it is difficult to count more than two or three ropes. 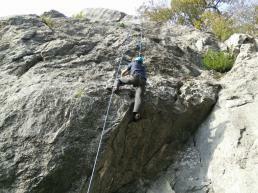 The rock on the easiest routes is particularly greasy, on the others it is still intact. Access: From Lecco go up to Ballabio continuing in Valsassina up to Chiusa, after Pasturo. Just over the bridge of Chiusa on Pioverna turn right and follow a road that passes to the side of the Sasso, clearly visible from the Povinciale. It is possible to park more or 100 m later at the House of the guides. Along the base of the Sasso to the right, you arrive in a minute, cutting left after 20m, to the Pala Condor and the adjacent wall of Introbio. Instead, following the main path, you get to the Pilastrini, in about 10 min. Continuing on the road, you reach the Casa delle Guide, under the plaque (fontanella).